the need for an early diagnosis. NICE Clinical Guideline 72 on Attention deficit hyperactivity disorder: diagnosis and management has been awarded the NICE Accreditation Mark. This NICE guidance is part of the NICE Attention deficit hyperactivity disorder pathway. providing post-diagnostic support including prescribing and monitoring under shared-care arrangements. Kewley G. Attention deficit hyperactivity disorder: recognition, reality and resolution. London: David Fulton, 1999. Symptoms of significant ADHD are associated with at least a moderate degree of psychological, social, and/or educational or occupational impairment, which occur across multiple settings and domains of social or personal functioning.4 Impairments may be temporarily masked by sophisticated strategies. Settings may include home, school, work, holiday, social activity, and consultations (although temporary masking may occur). Domains may include schoolwork, homework, family relationships, physical risks, friendships, driving, household tasks, money management, partner relationships, and childcare. Children and young people with ADHD appear less socially skilled, and exhibit more noncompliant, inappropriate, and negative behaviours in social settings than their peers.13 Individuals with impulsive behaviour may find it extremely difficult to anticipate consequence-based punishments as a result of a biological lack of self-control. Some children with ADHD are more likely to develop antisocial behaviours, particularly those who have the early onset of conduct disorder symptoms, learning problems, and environmental adversity.14 This group is more likely to enter the justice system, with around 45% of young offenders meeting criteria for ADHD15 (see Figure 1, above). ADHD is not synonymous with bad behaviour: children with ADHD may be well behaved and many who behave dreadfully do not have ADHD. Attributing difficult behaviour to 'bad parenting' is unhelpful as parents may be struggling to cope with their child with ADHD and may have ADHD themselves.13 Effects of ADHD on mental health, behaviour, self-esteem, and emotional–behavioural role function in children and adolescents can cause significant dysfunction of family life (see Case Studies in Box 3, below).16 The pressure on the family can cause parental anxiety/depression and parents may feel that they are failing. Children and adolescents with ADHD may be unable to fulfil their learning potential and often achieve poor academic outcomes: there is a higher incidence of truancy, dropping out of school, and expulsion. Danny was a 14-year-old boy whose parents mentioned their concerns about his difficult and unruly behaviour to the GP over the years. He had been given a second fixed-term exclusion from school. From an early age, Danny was argumentative and oppositional, very black and white in his points of view and never wrong. It was always someone else’s fault. At preschool, his parents thought that he was very bright. He spoke early, took great interest in things around him, and had lots of friends. As the years went by, he very much underachieved. His self-esteem was low and he really did not enjoy anything much in life. The GP referred Danny for an assessment and he was diagnosed with ADHD, which had been masked by his giftedness. A trial of psychostimulant medication strengthened his concentration and impulse control and over the next few months there was a clear improvement in his academic standard, self-esteem, and motivation. Bridget was a 7-year-old girl whose parents expressed their concern to their GP that she was saying she was not good at anything, she did not want to go to school, and she had no friends. They noted that she seemed very anxious. Before starting school, they had always felt that she was a fairly bright girl but they noticed that she tended to drift off and daydream. On specific questioning, it became apparent that at school, Bridget was switching off, not listening to the teacher, and appeared to be in a world of her own. She was not making progress with her reading or maths and her writing was clumsy. When asked, her teachers felt that if Bridget was able to stay attentive, she would be able to cope with any learning or handwriting difficulties. Bridget was referred for assessment and was diagnosed with inattentive ADHD. She was started on a low-dose psychostimulant medication and became brighter, more socially confident, and less anxious. Her academic work improved rapidly and she felt much happier at school. 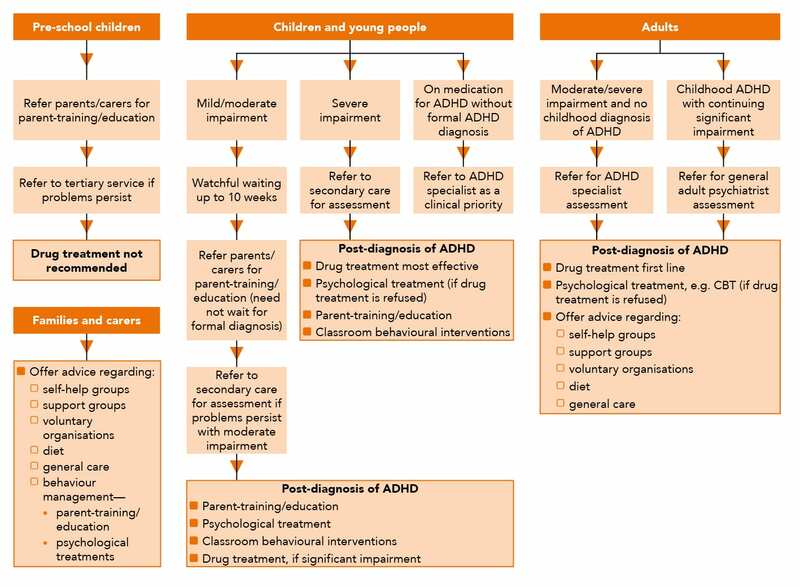 Individuals with ADHD can present to their primary care professional with a wide range of difficulties and in a variety of complex ways (see Box 4, below). It is useful to detect core symptoms of ADHD, but these may be masked by a number of factors including coexisting conditions, private schooling (attributed to smaller classes and hence fewer distractions and more opportunity for educational professionals to detect difficulties with struggling students and provide individual support), being gifted and talented, and receiving an inordinate amount of parental or other supports. Questionnaires or rating scales may help to identify core symptoms. entry to the youth justice system. Some individuals may present with suspected ADHD for the first time as adults or may have been treated for ADHD as children with symptoms suggestive of continuing ADHD (see Box 4, above). Parents of a child diagnosed with ADHD may also recognise that they themselves have the condition. Figure 2 (see below) outlines the interventions and referral procedures set out in the NICE guideline for people with ADHD presenting in primary care. Before obtaining a formal diagnosis, primary care professionals can offer support and advice to patients with suspected ADHD and their parents or carers. Information on parent training, psychological interventions, dietary advice, and specialist assessment may be useful. People with ADHD and their parents/carers may require advice about diet, behaviour management, and general care.4 Information can be given on local and national support and self-help groups, voluntary organisations, behavioural and psychological techniques, and positive parenting. A diagnosis of ADHD may cause sensitivity to stigma in relation to mental illness.4 Involving people with ADHD and their parents/carers in their management, together with professional guidance on evidence-based information, helps to enable them to make informed decisions and improve compliance. Major life changes in children and young people with ADHD, such as puberty, starting/changing schools, or the birth of a sibling, need to be anticipated to arrange adequate personal and social support or psychological treatment. Adolescents with ADHD benefit greatly from an understanding of the various difficulties concerning school, family, and friends. Advice can be given about the increased risk of antisocial behaviour, driving accidents, substance misuse, money management difficulties, and relationship problems (see Figure 1, above and Box 4, above). As well as amelioration of core symptoms, there is almost always associated improvement to many of the impairments associated with ADHD and patient self-esteem. The extent of residual difficulties and coexisting conditions usually becomes apparent after a few months. Psychostimulants available are methylphenidate (first-line) and dexamfetamine. They start to be effective within 20–30 minutes after taking and last between 4–12 hours, depending on the formulation. Long-acting formulations minimise the need to take doses during the schoolday, and may increase compliance and decrease the risk of stigmatisation by classmates and accountability of the school. Methylphenidate is not addictive as it is a sympathomimetic, not an amphetamine. The non-psychostimulant, atomoxetine can be used when psychostimulants are inappropriate, ineffective, or not tolerated. Effects can take a few weeks to become apparent. monitor side-effects and report any concerns to specialist. Routine blood tests and electrocardiograms for people taking methylphenidate, atomoxetine, or dexamfetamine are not recommended unless there is a clinical indication. The most common short-term side-effects for psychostimulants are difficulty sleeping or appetite suppression, but these usually diminish after a few weeks and can be modified with adjustments in dosage and timing. Children with appetite suppression can be advised to eat a good breakfast and then additional meals or healthy snacks when stimulant effects have worn off. Successful management of individuals with ADHD is critically dependent on shared-care arrangements and good communication between primary and secondary care. There is a need for integration of ADHD services to achieve the best outcomes through collaboration between primary care, ADHD specialist care, education services, social care, the youth justice system, and healthcare commissioners. Service provision needs to acknowledge the complexities of the disorder, its treatment requirements, and the cost of unmanaged ADHD to affected individuals and society as a whole. Urgent development of adult services across the UK is a priority along with effective transition into adult services for young people with persistent symptoms. be reviewed at least annually: prescribing and monitoring are recommended under shared-care arrangements. Commissioners should also define clear pathways for transitioning of patients between children's and adult services, ensuring there is no relaxation in standards of care during this transition. Thomas R, Mitchell G, Batstra L. Attention-deficit/hyperactivity disorder: are we helping or harming? BMJ 2013; 347: f6172. Biederman J, Mick E, Faraone S. Age-dependent decline of symptoms of attention deficit hyperactivity disorder: impact of remission definition and symptom type. Am J Psychiatry 2000; 157 (5): 816–818. Cortese S. The neurobiology and genetics of attention-deficit/hyperactivity disorder (ADHD): what every clinician should know. Eur J Paediatr Neurol 2012; 16 (5): 422–433. Banerjee T, Middleton F, Faraone S. Environmental risk factors for attention-deficit hyperactivity disorder. Acta Paediatr 2007; 96 (9): 1269–1274. Murray-Close D, Hoza B, Hinshaw S et al. Developmental processes in peer problems of children with attention-deficit/ hyperactivity disorder in the Multimodal Treatment Study of Children With ADHD: developmental cascades and vicious cycles. Dev Psychopathol 2010; 22 (4): 785–802. Hjern A, Weitoft G, Lindblad F. Social adversity predicts ADHD-medication in school children—a national cohort study. Acta Paediatr 2010; 99: 920–924. Young S, Thornr J. ADHD and offenders. World J Biol Psychiatry 2011; 12 Suppl 1: 124–128.